The latest update for the zombie-flavored survival RTS They Are Billions is out now, and it adds the powerful Six Wonders – massive, expensive late-game structures that can boost your economy and add to your score. Unsure of where to start? Check out our handy strategy guide for They Are Billions. Because of how much they cost to research and construct, it “can be challenging or almost impossible” to build all the wonders on a single map. That means you’ll have to think carefully about which one you want to work towards. This portentous structure reaches toward the sky, capturing the energy of lightning for the colony. In addition, it extends the power supply, acting as a huge Tesla Tower. No one knows how it works, but this extraordinary and smoky metal spawn is capable of transforming common materials into precious oil. Oil Supply: +40 (by transmutating 20 wood, 20 stone and 10 iron). This unbreakable bunker stands as the most amazing symbol of the victory of humanity against the infected. It’s a beacon of hope and courage for everyone in the colony. Colonists Hope: +20% gold generation for the surrounding dwellings. Unbreakable: Defenses Life 8000, Armor 10. In this glorious academy, the most famous heroes train the army to battle with the skills and courage of experienced veteran soldiers. All army units and new units trained are veteran. This magnificent architectural wonder generates its own climate control environment, where the best crops bloom and thrive, feeding the colony even in the most barren lands. Food Supply +800 on any terrain. It’s the most precise and complex machine ever created. The Beholder is installed on top of the Command Center revealing the entire map. Nothing can escape its prodigious eye. Reveals all the map and enemies permanently. 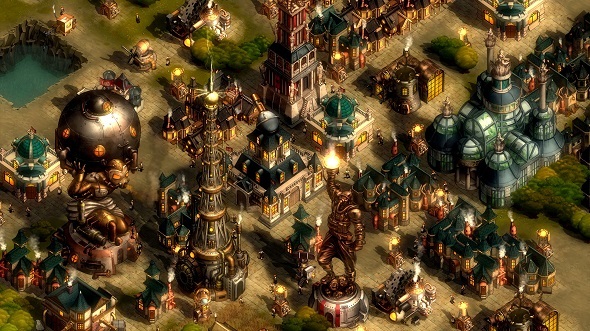 They Are Billions is still in Early Access, but it’s already a very fully-featured game.